Ah yes, that familiar sullen look paired with the cherubic smile in Pride and Predudice. It's probably the first era that comes to mind when I think about costume dramas. 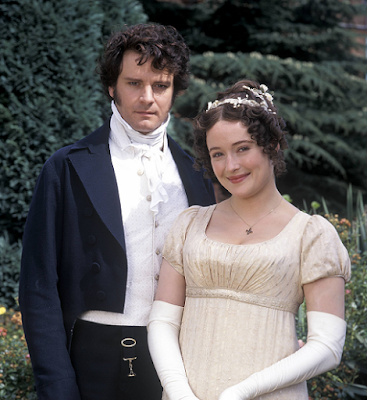 I watched the six-part series when I was about 16, and there will never be another Mrs Bennet or Mr Colins for me. I was feeling quite content with my progress through the 18th century. Sure, it needed quite a bit more tweaking and I'm sure would horrify those truly Historically Accurate seamstresses out there. But for me, I had a fairly good grasp of the development of the main fashions from the 1720s though to 1785. Now it was time for a new era. Logic pointed to Regency. This should be fun! Time to start researching further beyond simply a higher waistline and no panniers. At this stage, I had gathered that stays changed from the heavily boned to the lighter boned and then by this stage into the almost un-boned. It seemed that there was a drastic change from "as fake as possible" of the 18th century to the classical, girlish, wispy look of the regency period. With this came the redundancy of the boning as the waist/torso was not really seen below the under-bust. The point of stays was simply to lift and separate the bust, while doing nothing much else beyond possibly pulling the shoulders back for the proper posture. 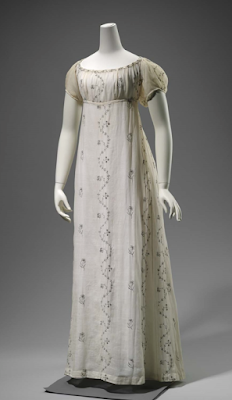 I decided to start into the decade where the style was most exaggerated: 1810. Waistline was the highest it could possibly go, and dresses were gauzy and delicate. A new shift. 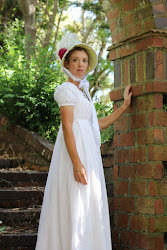 Regency dresses had short sleeves, so my 18th century shift with elbow-length sleeves wouldn't be suitable. A petticoat. You know how they used gorgeously floaty gauzy cottons? Well they are see-through. Apparently there were any number of newspaper satires drawn showing the difference between the 5 layers of the Georgian vs. see-through Regency! So that should all keep me busy for quite some time!